Mt. 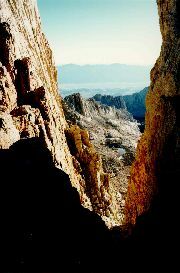 Whitney, in California's High Sierra, is a great attraction for hikers because, at 14,495', it is the highest peak in the 48 contiguous United States. The summit affords a spectacular view, and represents the southern terminus of the 212-mile John Muir Trail. To hike Mt. Whitney in one day is a challenge because the trail is both long (11 miles each way) and arduous (6000' gain from the trailhead), though well-engineered and not technically difficult. I (Daniel) have been on the summit of Mt. Whitney four times previously, twice on backpacking trips, and twice on day hikes, but in the early autumn of 1996 I fulfilled a long held desire to hike Mt. Whitney by the light of the full moon. At the last minute, I talked (bribed) my older son Danny into joining me, and before he could come to his senses and change his mind, we were on our way. The night before our trip, there was a beautiful lunar eclipse. The first time I hiked Mt. Whitney, no permission was necessary. Then the Forest Service began to issue wilderness permits. Later, the Forest Service introduced a quota system for overnight travel and required wilderness reservations for backpackers. Finally, in 1996, the Forest Service instituted a quota for day hikers as well. My permit is shown to the right. Note the "Yes" in the box labeled "Full Moon Exemption". This allows "day" hikers to extend their trip by 12 hours before or after the official date on the permit. Apparently, we were not the first to think of hiking Mt. Whitney by moonlight. 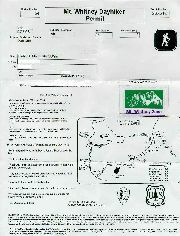 Beginning in 1997, a backpacker's permit will be required for a full moon "day hike". Here's a map of the route. The trail is very well engineered and maintained, and easily visible by moonlight without need of a flashlight, even in shadow. 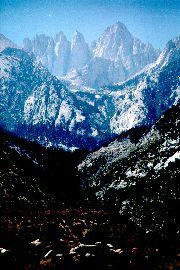 Driving from U.S. Route 395 to the trailhead at Whitney Portal, here is a view looking west toward Mt. Whitney from the Owens Valley. A closer view of Mt. Whitney. Also distinguishable are Mt. Muir. Keeler Needle, Day Needle, and near the left, Trail Crest. A silouhette view of Mt. Whitney in the late afternoon. Near the beginning of the hike, the moon has just risen in the east against a background of the White Mountains. The view from Trail Camp, about two-thirds the way to the top. The moon is amazingly bright. We took a long rest here and tried to sleep, but it was too cold. Approaching Trail Crest, the 13,600' pass at the boundary of Sequoia National Park. Looking east from Trail Crest, the dawn is just beginning. We had another long rest at this pass. 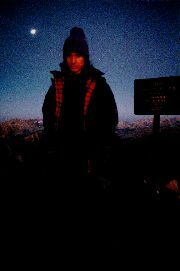 At Trail Crest, Danny experiences the first rays of the sun, the full moon appearing in the western sky. Daniel and Danny at Trail Crest. The view northwest from Trail Crest. We begin the 2.5 mile hike from Trail Crest to the summit. The trail stays on the east side of the ridgeline. As we get closer, the flat expanse of the summit of Mt. Whitney appears in the distance. Occasionally, a spectacular view opens up to the east. The view east from near the summit. Danny is now making the final ascent. Daniel and Danny on the summit of Mt. Whitney. We reached the top at 9 A.M., twelve hours after we began the hike (a new world's record?). In spite of the near superhuman effort required to reach the summit, we find that we are not alone. After spending two hours at the summit, we begin the long hike down. This view is looking south along the ridge. Looking back up while descending from Trail Crest. The series of switchbacks seem even more endless going down than they did on the way up. Sun-cupped snowfield near the trail. Ice on the trail. Fortunately we had full sets of crampons and ice axes to negotiate this treacherous terrain. Late in the day, a meadow below Mirror Lake. With three miles left to go, night is fast approaching. Lone Pine Lake is visible in the background. We arrive at the trailhead at 8 P.M., twenty-three hours after we began.